Hoshyar hired a media company with a strong knowledge of storytelling and the technical know-how of creating visually stunning images. Creative director and copywriter Ted Cooper partnered with Sliderocket to create the presentation for Hoshyar. The story was designed to pull at the heartstrings of potential donors and motivate them with a straightforward, simple call-to-action — to “just click to make a difference”. 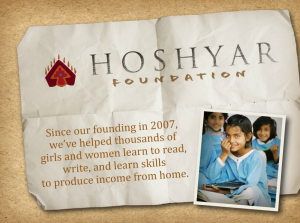 Hoshyar e-mailed the presentation to its list of around 400 friends and donors, and then watched the presentation spread like wildfire – a vivid example of how professionally produced multimedia can make a difference. Hoshyar is not Sliderocket’s only beneficiary. Having seen how multimedia can spread awareness of social issues, Sliderocket is now hosting a contest that will award $30,000 to five nonprofits that create the best presentations. Four will receive $5,000 and one $10,000. Winners will be chosen “based on the best storyline, composition/visuals, compelling cause and the number of unique presentation views,” according to the guidelines. This originally appeared on the Major Multimedia blog.Lauren Major is a visual storyteller who helps nonprofits, NGOs and small to mid-size businesses create and share their stories of social good and corporate social responsibility. She is a visual artist, consultant, producer and a partner in Socialbrite. Visit her profile page, see her Major Multimedia site and blog, follow her on Twitter and Google Plus or leave a comment.